This article will cover how to create a basic KML file so that your Excel data can be mapped on Google Earth. There is a more advanced implementation in Data Driven Mapping applications which can plot complex google visualizations on top of either Google Maps or Google Earth right out of Excel. If you just want a to try it, then you can download an example application (googleMapping.xlsm) and come back here later. Note that you may want modify the filenames for the output files to some directory that suits you before running. These filenames can be found in the GeoCoding Worksheet and look like this - just change the 'Code' Column for filename in ther Marker KML parameter block to something appropriate for your PC. Some directories on your machine may be readonly to you - for example if you have downloaded this and run it from the download directory on windows 8 you may not be able to create a file in that directory because of local permission settings. You should set this to a directory you have permission to create files in. Note also that by default, a session of Google Earth (or whatever you have associated with the kml suffix), will kick off after generation of the file. You can change this behavior in the control parameter block by setting the browser to 'none' if you only want to create the file and not execute it. 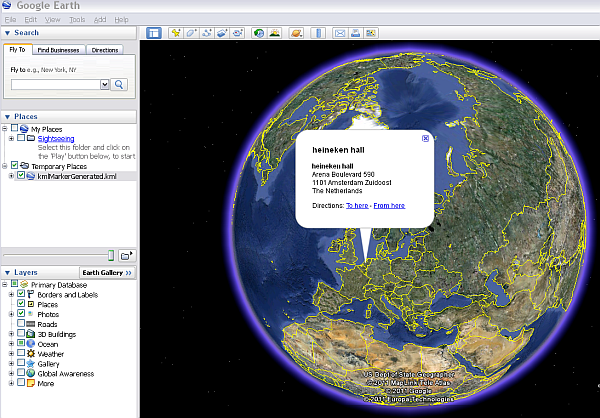 KML is a markup language for describing how to display geographic data to Google Earth and other great resources. Just as we can map your data to google maps straight of Excel, we can do the same with Google Earth or other KML capable systems by generating a simple KML file. The process is no different and the VBA code just as simple as with the mapping solutions. and here is what a generated KML file looks like. We normally use jSon to communicate with mapping packages, but since kml is xml based we need different approach to formatting the output data. Aside from this there is no difference in the code to that point. item & vbLf & "</" & tagName & ">"